Nearing last call. The Toronto-Dominion Sparks branch served as a sales centre for the development that is poised to replace it. Image: September 2015. 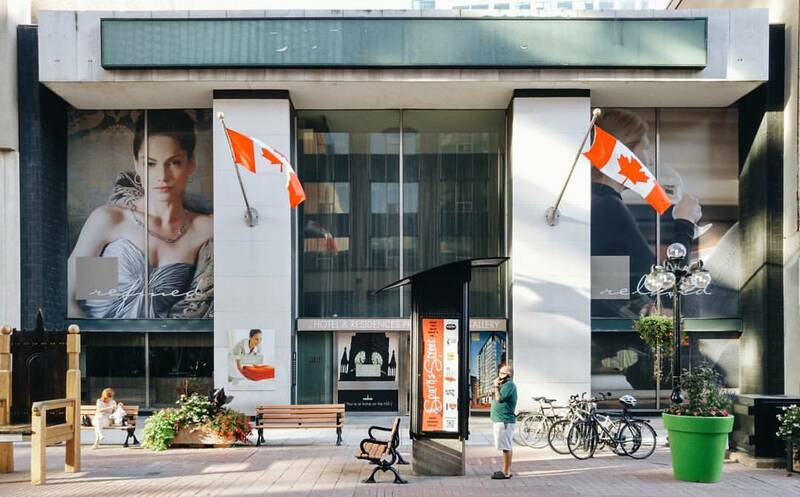 Earlier this spring, the Toronto-Dominion Bank branch on Sparks street was demolished to make way for Ashcroft’s much-delayed reResidences project.1Also known as the Canlands ‘A’ development. See Contentworks Inc. 111-113 Queen St. & 106-116 Sparks St., Cultural Heritage Impact Statement. June 2013; Patrick Langston. “Cosmopolitan Mr. Choo,” Ottawa Citizen, December 12, 2009, p. 19; Mark Brownlee. “Still waiting for a spark,” Ottawa Business Journal, October 30, 2012; NCC Watch, Canlands ‘A’ Archive; “Ashcroft to start over on facade of long-delayed Sparks street project,” Ottawa Business Journal, February 13, 2014; David Reevely. “Decrepit Sparks Street building to be demolished for Ashcroft project,” Ottawa Citizen, February 13, 2014; Ashcroft Homes / CNW. “For the first time in 150 years; 108-116 Sparks St. heritage façade work underway.” May 11, 2016. While the heritage façade of the former Centre Theatre seems to have garnered most of the attention, for one reason or another, it is the demolition of the midcentury modern Toronto-Dominion Bank branch that has captivated me. Gone is Sparks Street’s temple of commerce. Image: July 2016. 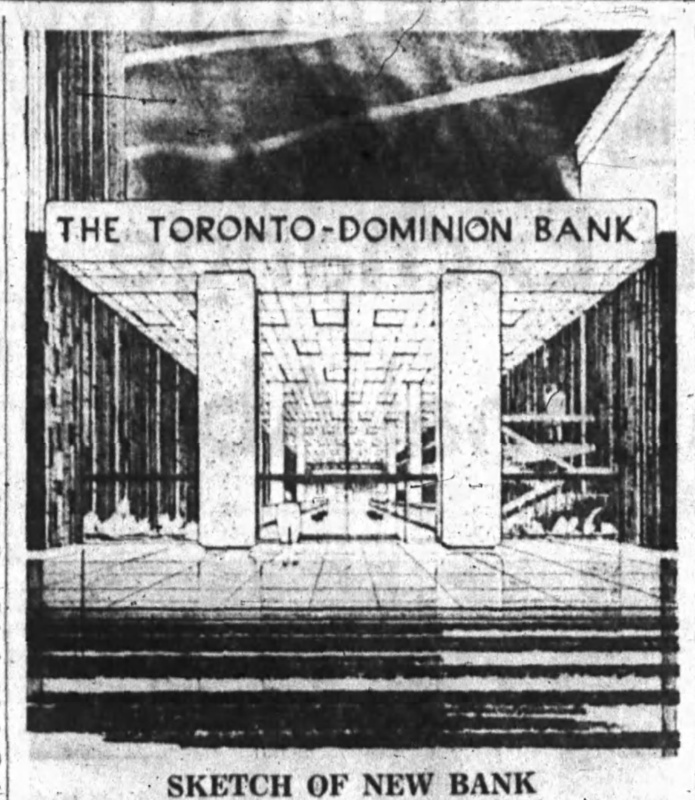 In the Spring of 1962, the Journal reported that Toronto-Dominion Bank had planned to construct a million dollar “prestige” bank branch and four-storey office on Sparks street. Preliminary plans were being drawn up by the bank’s in-house architects and an external architect would be hired to complete them. The project would necessitate the demolition of the Holbrook Building and the bank’s existing quarters and the project was expected to be complete “by the end of 1963.”2”$1,000,000 Sparks Street Building Plan,” Ottawa Journal, April 14, 1962, p. 11. By the summer, the plans had grown: the Citizen reported that Toronto-Dominion officials were looking into a proposal “made by a British syndicate… for an L-shaped high-rise office building on the Sparks-Metcalfe corner.”3”High Rise Interests Bankers,” Ottawa Citizen, July 5, 1962, p. 3. Nothing further had been announced by the Fall. The planning and negotiation of such a deal was taking much longer than anticipated and when asked by the Citizen, Toronto-Dominion president Allen T. Lambert responded that the bank was “still anxious, one way or another, to provide prestige accommodation for our main Sparks Street branch.”4”Prestige bank plans still alive,” Ottawa Citizen, November 16, 1962, p. 3. Given Ottawa’s relative size and the importance of Toronto-Dominion’s branch modernization program, it’s no surprise that the project was a priority.5See, for example, the bank’s history as outlined on Wikipedia. Also see Montreal Gazette, December 7, 1960, pp. 12-13. 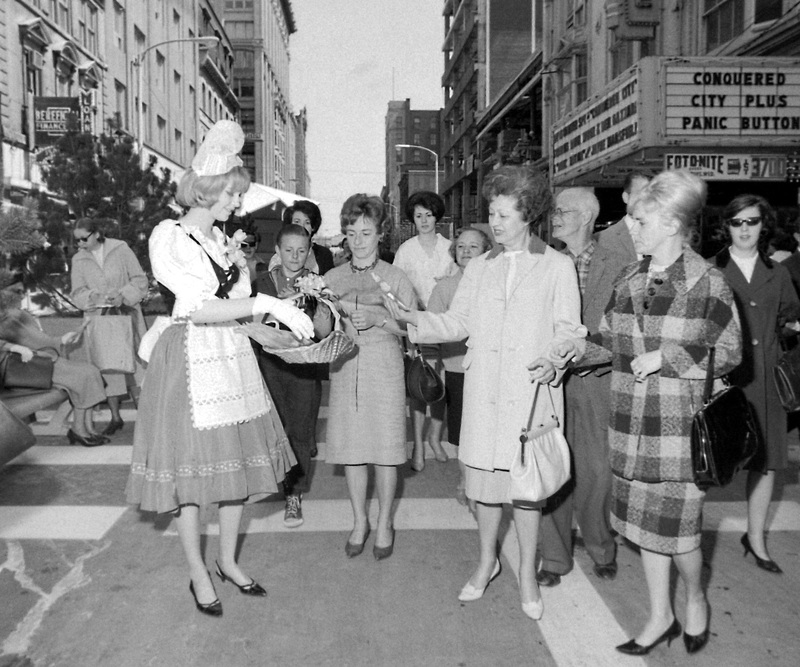 RA Queen Marilyn Dorion hands out Riggio cigarettes during the 1965 Tulip Festival parade. The Centre Theatre is showing Conquered City (1962) and Panic Button (1964). The Toronto-Dominion branch and Montreal Trust building are visible behind, under construction. Image: Ted Grant / LAC Series 65-0149. The difficult negotiations between Toronto-Dominion, the Montreal Trust Company and Canada Permanent Trust Company stalled out entirely during the Spring of 1963 and in July, the bank announced that each of the parties would then go it alone. For TD, Lambert still envisioned a 4-5 storey “first-class banking office on our two lots on Sparks Street.”6$ million bank office for Sparks,” Ottawa Citizen, July 22, 1963, p. 22. In January 1964, Mayor Charlotte Whitton proudly disclosed that all three projects: the Montreal Trust Building at the corner, the Permanent Trust building at Metcalfe and Queen, and the TD project were all a go. Unlike its two neighbours, Toronto-Dominion’s plans had not yet been finalized.7”Plan New Sparks St. Buildings,” Ottawa Journal, January 29, 1964, p. 1; “Downtown to get 3 new buildings,” Ottawa Citizen, January 29, 1964, p. 3. While under construction, the Toronto-Dominion Sparks Branch temporarily occupied the space vacated by the Tea Garden, just down the street. Image: Ted Grant / LAC Accession 1981-181 NPC Series 60-745 May 1960. “New Sparks Street bank to be only one storey,” was the headline run in the Citizen on February 19. It was reported that the bank was to soon announce the construction of a one-storey “prestige” building on its two Sparks lots. Toronto’s Mathers and Haldenby were retained as the architects on the project.8See TOBuilt for more examples of the firm’s output. It seems that at least a small part of the former collaboration saw the light of day: the heating and cooling systems for the TD were tied in to the Permanent Trust building at the rear, also designed by Mathers and Haldenby.9”New Sparks Street bank to be only one storey,” Ottawa Citizen, February 19, 1964, p. 39. 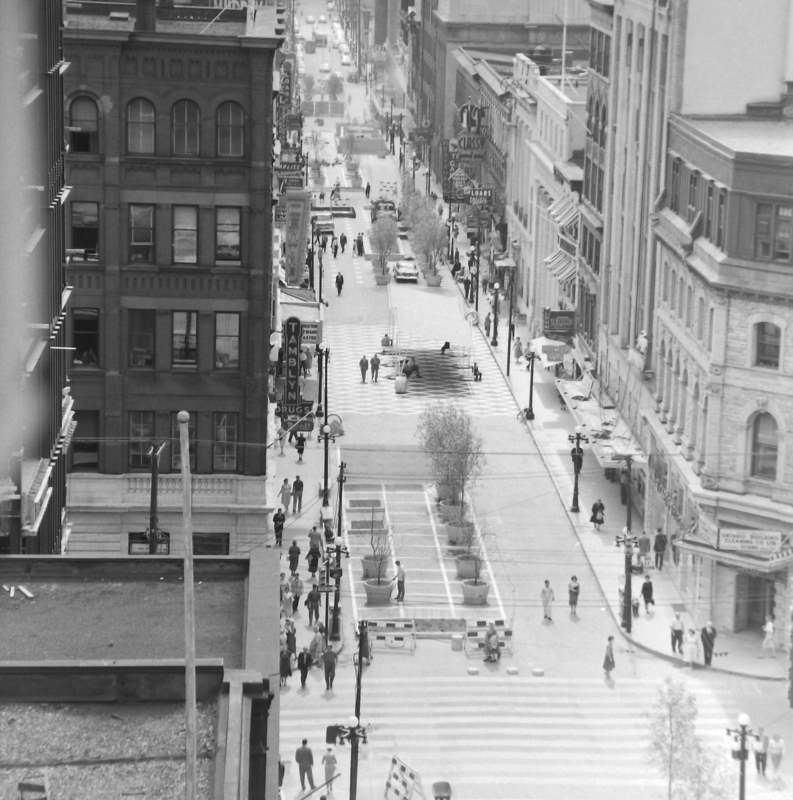 Upon announcement of the plan, Harold Wyman, president of the Sparks Street Development Association, dispatched letters to both TD and Montreal Trust asking them to consider the street-level retail presence of their buildings.10It was not, of course, possible for TD to do so, but Montreal Trust was able to: the two spaces are home to a Bridgehead and freshii today. See “Urge banks provide store space,” Ottawa Citizen, February 21, 1964, p. 3. The corner of Sparks and Metcalfe from above, 1960. Image: Ted Grant / LAC Accession 1981-181 NPC Series 60-803, Image 35. On March 31, 1964, TD made what was known official: Sparks Street was going to receive a new look in the form of its new ultra-modern prestige bank branch. Demolition of the existing buildings was to being on April 18. 11”New Look For Bank on Sparks,” Ottawa Journal, March 31, 1964, p. 4. While construction was underway, the Citizen reported that the sidewalk superintendents found enjoyment watching the three projects make all attempts to “keep building machinery and staff out of each other’s hair” and wondered why “the three companies did not pool their land sites and organize a cooperative.” The expected date of completion for the TD was June 1965.12”Builders space scarce,” Ottawa Citizen, December 1, 1964, p. 40. Though it was likely a matter of incompatible visions, shifting priorities, and differing timelines, it would have been interesting to learn about why the partnership failed to materialize.13There was some implication that the sale of the former Royal Bank property to Montreal Trust by the “British interests” had something to do with it. Sketch of the new branch run in the Ottawa Journal. Source: Ottawa Journal, March 31, 1964, p. 4. An opening date in June 1965 turned out to be somewhat ambitious: the building was not complete until November, and the official opening ceremony, attended by Mayor Don Reid was held on November 19. The branch opened for business officially on the following Monday at 10:00am.14Ottawa Citizen, November 18, 1965, p. 4. I am not going to make any attempt to either transcribe existing descriptions of the bank’s style, nor will I make any attempt to write any of my own. I have reproduced below five photographs taken by Ted Grant during a December evening in 1965. They say more than I could with clumsy purple prose. Ted Grant / LAC Accession 1981-181 NPC Series 65-0189 December 1965. For more details about the Toronto-Dominion branch’s history and engagement with the architectural style, see Robert Smythe’s 2010 URBSite piece, Toronto Dominion. 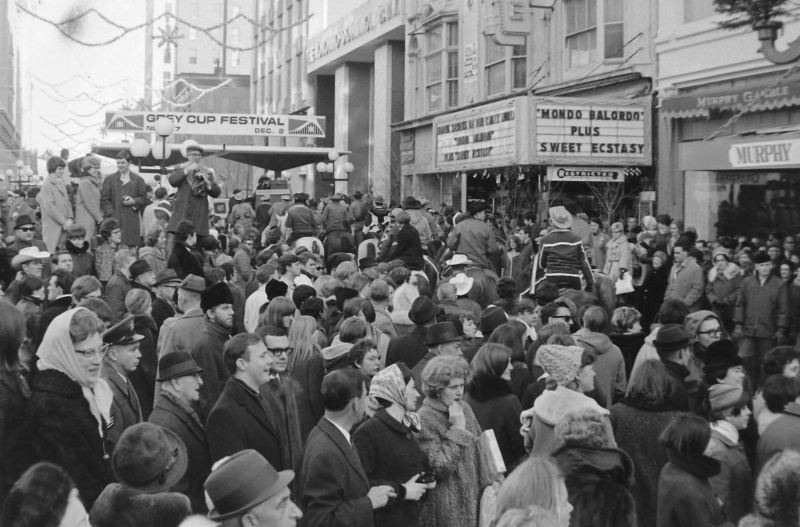 Crowds occupy Sparks Street for the 1967 Grey Cup Festival. This time, the Centre Theatre catered to the out-of-town crowds with Mondo Balordo (1964) and Sweet Ecstacy (1962). The completed Toronto Dominion branch and Montreal Trust building are visible in the background. Image: Ted Grant / LAC Series 67-328-1. November 30, 1967. Of course, as much as I would have preferred to see Mathers and Haldenby’s Toronto-Dominion branch stand another fifty years (I’ve always loved that branch), it’s worth remembering that it too came at the cost of an existing building. In this case, there were two buildings demolished: the Holbrook Building, and the former quarters of John Heney & Son, coal dealers. 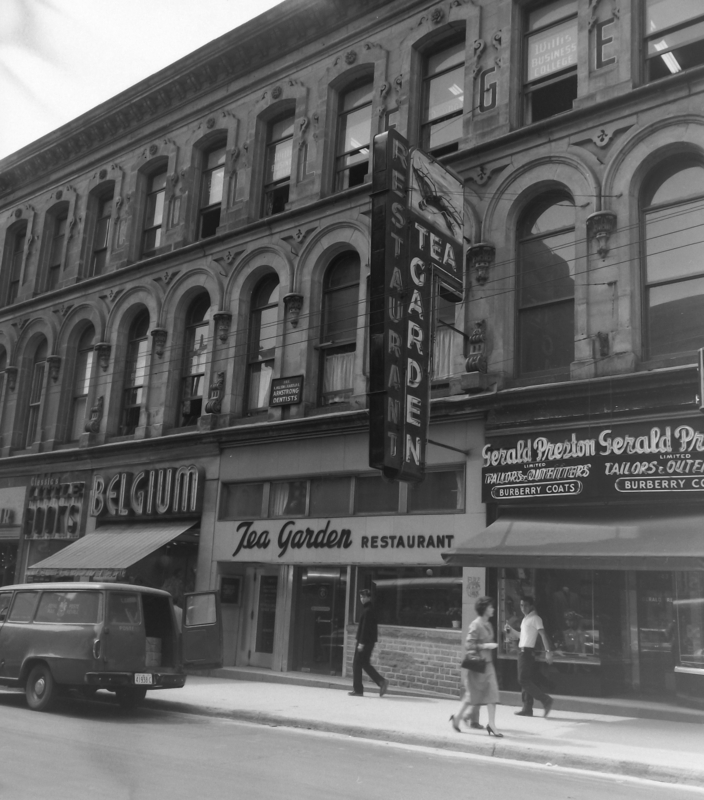 One in from the corner, the Holbrook Building stood proud on Sparks street until the lamented TD branch necessitated its demolition. Image: Topley Studio / LAC Accession 1936-270 NPC Box 00603E Item 389. 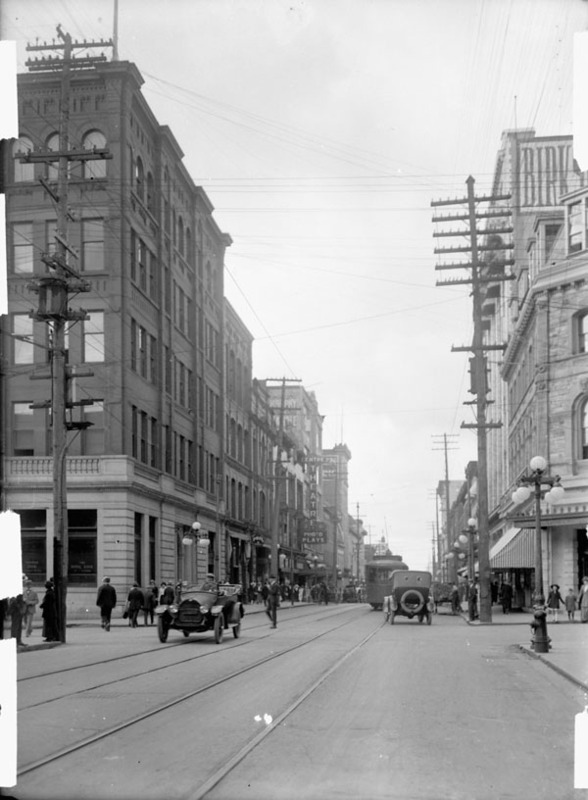 For much more information about how the southwest corner of Sparks and Metcalfe has changed, see Sparks’ Departed Departments (II): C. Ross & Co.
Ted Grant and a bird’s eye view of the Sparks and Metcalfe intersection. Image: Ted Grant / LAC Series 60-803 June 1960. 1. ↥ Also known as the Canlands ‘A’ development. See Contentworks Inc. 111-113 Queen St. & 106-116 Sparks St., Cultural Heritage Impact Statement. June 2013; Patrick Langston. “Cosmopolitan Mr. Choo,” Ottawa Citizen, December 12, 2009, p. 19; Mark Brownlee. “Still waiting for a spark,” Ottawa Business Journal, October 30, 2012; NCC Watch, Canlands ‘A’ Archive; “Ashcroft to start over on facade of long-delayed Sparks street project,” Ottawa Business Journal, February 13, 2014; David Reevely. “Decrepit Sparks Street building to be demolished for Ashcroft project,” Ottawa Citizen, February 13, 2014; Ashcroft Homes / CNW. “For the first time in 150 years; 108-116 Sparks St. heritage façade work underway.” May 11, 2016. 2. ↥ ”$1,000,000 Sparks Street Building Plan,” Ottawa Journal, April 14, 1962, p. 11. 3. ↥ ”High Rise Interests Bankers,” Ottawa Citizen, July 5, 1962, p. 3. 4. ↥ ”Prestige bank plans still alive,” Ottawa Citizen, November 16, 1962, p. 3. 5. ↥ See, for example, the bank’s history as outlined on Wikipedia. Also see Montreal Gazette, December 7, 1960, pp. 12-13. 6. ↥ $ million bank office for Sparks,” Ottawa Citizen, July 22, 1963, p. 22. 7. ↥ ”Plan New Sparks St. Buildings,” Ottawa Journal, January 29, 1964, p. 1; “Downtown to get 3 new buildings,” Ottawa Citizen, January 29, 1964, p. 3. 8. ↥ See TOBuilt for more examples of the firm’s output. 9. ↥ ”New Sparks Street bank to be only one storey,” Ottawa Citizen, February 19, 1964, p. 39. 10. ↥ It was not, of course, possible for TD to do so, but Montreal Trust was able to: the two spaces are home to a Bridgehead and freshii today. See “Urge banks provide store space,” Ottawa Citizen, February 21, 1964, p. 3. 11. ↥ ”New Look For Bank on Sparks,” Ottawa Journal, March 31, 1964, p. 4. 12. ↥ ”Builders space scarce,” Ottawa Citizen, December 1, 1964, p. 40. 13. ↥ There was some implication that the sale of the former Royal Bank property to Montreal Trust by the “British interests” had something to do with it. 14. ↥ Ottawa Citizen, November 18, 1965, p. 4.